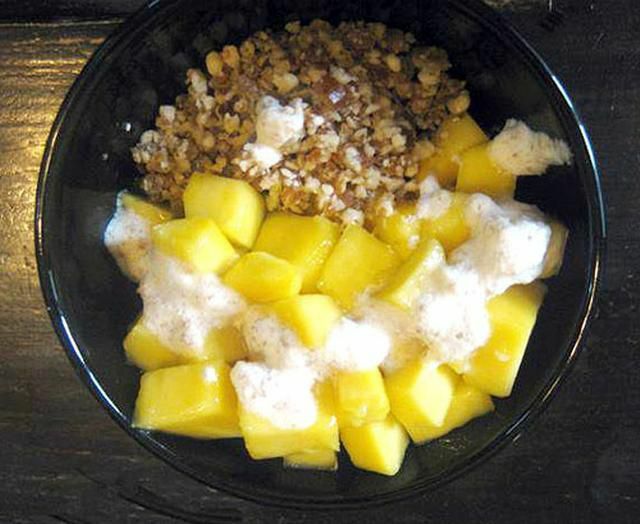 Raw cereal or muesli, with fresh diced mango and topped with a thick raw almond nut cream. Delicious!. If you've gone vegan, you may find it can sometimes be hard to find breakfast ideas to fit your diet. This raw food muesli is incredibly delicious; you'll enjoy every mouthwatering bite! It's similar to a healthy muesli or granola cereal with fresh fruit and topped with raw nut milk, and is a wonderfully healthy breakfast idea for those eating a raw and living foods diet. It's a terrific recipe as is, but to make it truly amazing, add coconut oil -- that's the secret ingredient to make this raw granola muesli truly praise-worthy.